Imagine what it would be like if you never came to the zoo. You may have memories of your children enjoying the open space, learning about animals, or just being happy to share time with you. But in a wildly booming city like ours, we are also seeing increasing economic inequality. Too many of our neighbors, community groups, and families never have the chance to come and enjoy the zoo. 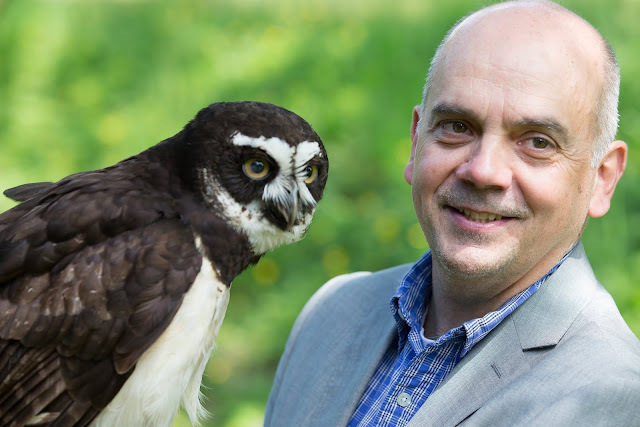 As the President and CEO of Woodland Park Zoo, I am proud of our efforts to more than double the opportunities to keep our zoo accessible to everyone in our community– whether it’s through complimentary passes to local nonprofit partners or through new programs we launched to make the zoo more affordable and accessible to all. A quiet moment on the Northern Trail. 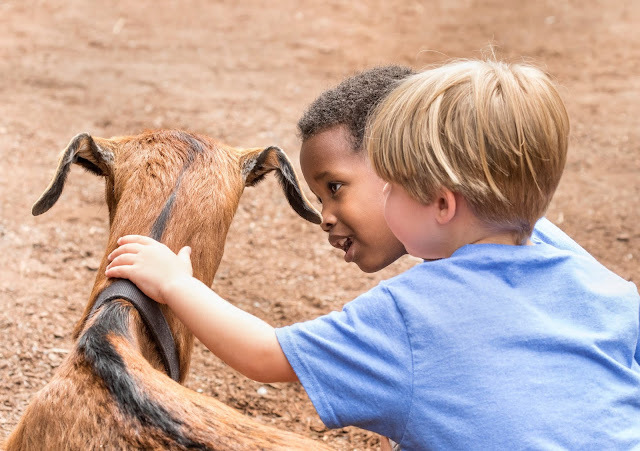 Through the $5 DiscoverTicket and a $35 Explorer Pass membership, current recipients of Washington Quest/EBT and/or WIC assistance will have more opportunities to visit the zoo. 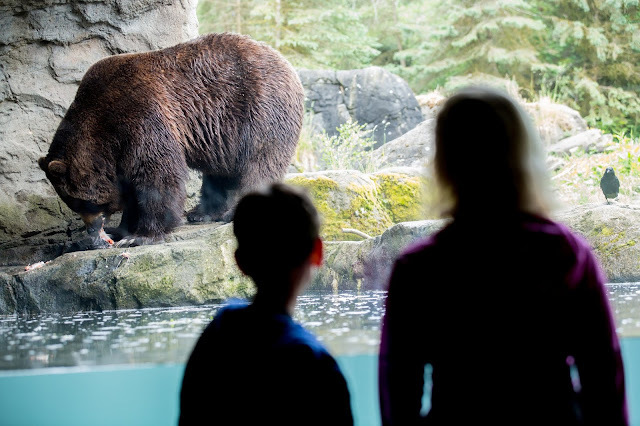 The $5 Discover Ticket will be available this September 4 through March 31, 2019 at all Woodland Park Zoo entrances for up to six individuals in the same family. Earlier in August, the zoo also launched the $35 Explorer Pass membership, which provides free admission for up to eight individuals to the zoo year round for current recipients of Washington Quest/EBT and/or WIC assistance. Due to the overwhelming popularity of this program, we were unable to provide a membership to everyone who applied, but future opportunities to apply for this family membership will begin in August 2019. I am also proud that our zoo participates in the Seattle Public Library Museum Pass program, which allows Seattle Library card holders to access free entry to the zoo by reserving through their website. Soaking up the daisy-filled Molbak's Butterfly Garden! Guests visit with Blueberry the hornbill at an Ambassador Animal encounter. At the same time that we are finding a way to make the zoo more affordable, we are also continuing our popular Community Access Program. 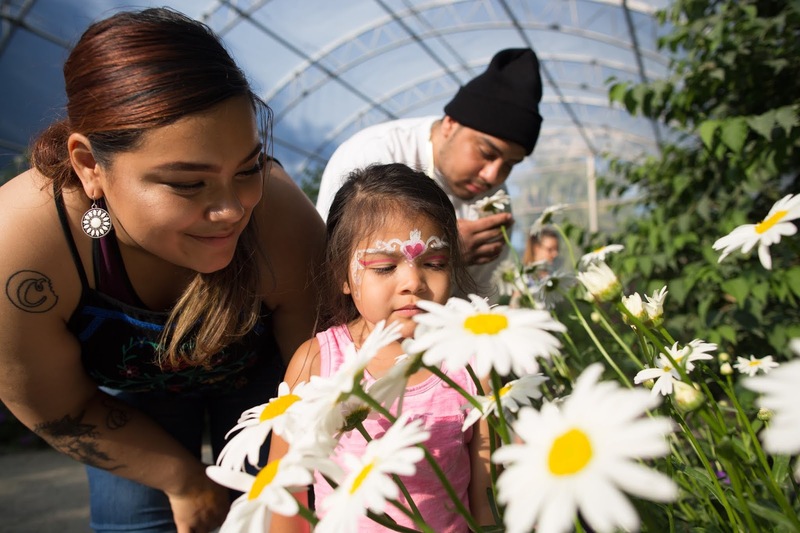 We partner with more than 600 human and social service organizations across Puget Sound to offer hundreds of thousands of complimentary zoo passes. 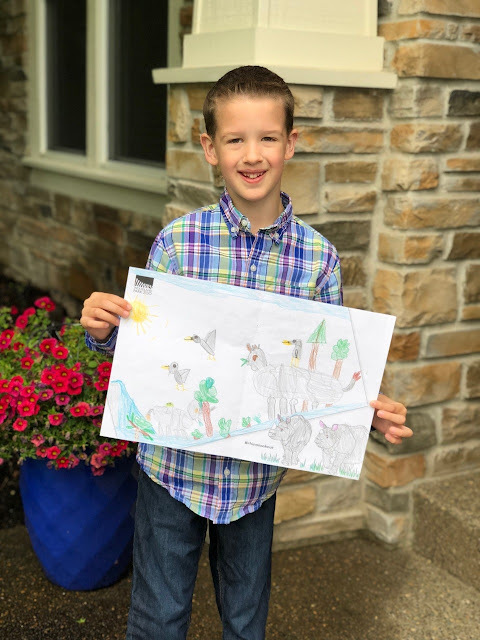 This summer also saw the first of many Zoo for All events honoring individuals and families from the special needs community as well as current and former U.S. military personnel and their families. We hope that by creating more flexible options, we will become a nationwide model for other institutions to increase their accessibility and inclusivity. A trip to the zoo is a chance to create or strengthen our relationship with nature. We cannot accomplish our mission of inspiring everyone to make conservation a priority in their lives unless we are accessible to everyone. 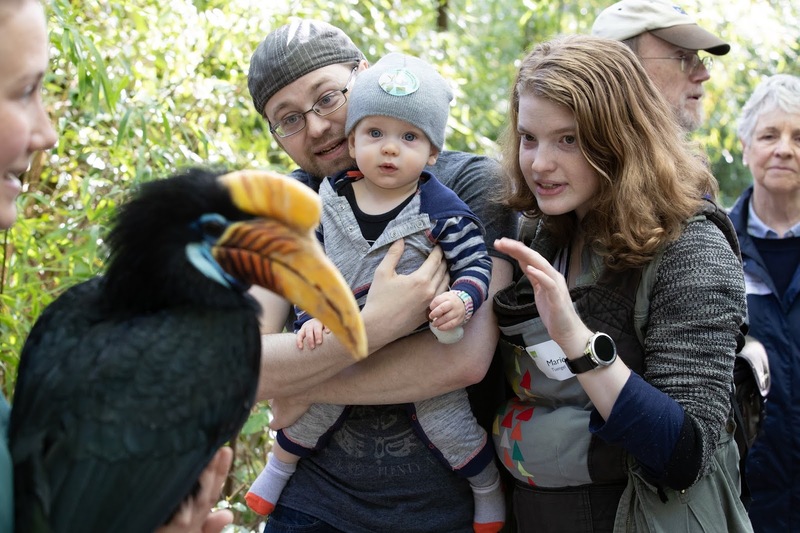 These programs ensure that Woodland Park Zoo continues to reach the broadest audience possible while continuing our work to inspire the empathy and connection to nature that leads to conservation actions. After all, it will take all of us working on conservation to save species and protect wildlife both locally and globally. Up close with a new friend at Family Farm. Opening up Woodland Park Zoo to as many people as possible is simply the right thing to do, and we are proud to double the number of opportunities for the community to experience animals, nature and each other. We pride ourselves for being deeply embedded in our community and we want to welcome everyone to enjoy extraordinary experiences. These opportunities are only possible thanks to the generous public and private support the zoo receives and from guests like you. The zoo belongs to everyone. It has been a community treasure for more than 100 years, and my goal is to make it a zoo that everyone can experience. If you have ideas for ways to continue to help make the zoo accessible and affordable for other groups, feel free to contact our Community Access Program at cap@zoo.org. Alejandro Grajal, President and CEO, with Coba the spectacled owl. We are very excited to welcome a new gorilla to Woodland Park Zoo this September: a male named Kwame (KWA-may) who will be coming from Smithsonian’s National Zoo in Washington, D.C. Kwame is 18 years old—right in the age range when males typically assume the role of silverback, which is the head of a gorilla family group. Silverbacks, which are so named because of the silvery hairs that grow in when an adolescent male comes of age, play a critical role in gorilla families. They protect, they lead and they maintain peace in the group. It’s not natural for an established gorilla family to live without a silverback. The Gorilla Species Survival Plan, one of many conservation programs that spans across accredited zoos and aquariums, made the recommendation to move Kwame to Seattle to provide stability for one of our groups. 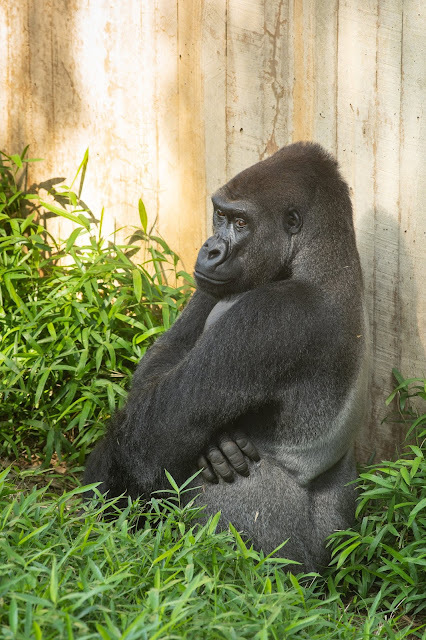 2-year-old Yola, 22-year-old Nadiri who is Yola’s mom, and 17-year-old female Akenji have been without a silverback to lead their group since 40-year-old Leo passed away suddenly in March. 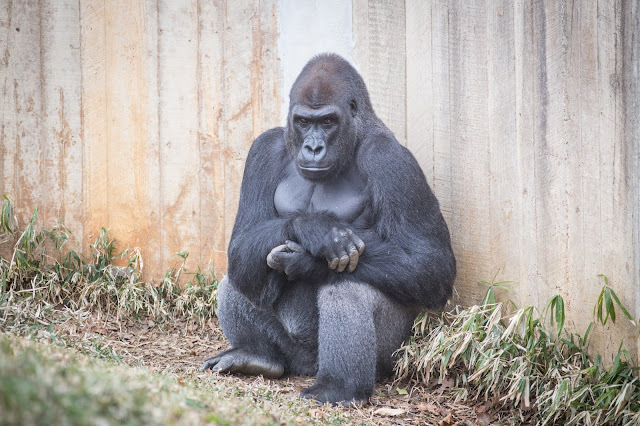 Since his death, the zoo has been searching for another silverback to step into Leo’s role. If you have followed little Yola's story, then you know all about the incredibly dedicated team of animal keepers who are, without a doubt, world-class animal care experts and profoundly compassionate and determined humans. Their expertise will again be key to navigating Kwame's introduction to this group and we'd like to thank them for their dedication and energy for the smoothest and most comfortable transition for these animals. They are in the best care. According to keepers who’ve known Kwame his whole life, becoming a leader is a role he is more than ready to fill. Kwame was born at Smithsonian’s National Zoo where he currently lives in a bachelor group with his younger brother. Kwame’s name originates from West Africa (Ghana and the Ivory Coast) and means “born on a Saturday” because he was born on Saturday, November 20, 1999. He is nearly full grown at 315 pounds and the care staff at Smithsonian’s National Zoo say that Kwame really is a gentle giant. He may look intimidating, as he loves to show off with theatrical displays. But once he settles in, they tell us we will see that he is a stoic, tender, sensitive and intelligent gorilla. “We are confident that he will be a capable and appropriate leader of his new group at Woodland Park Zoo. 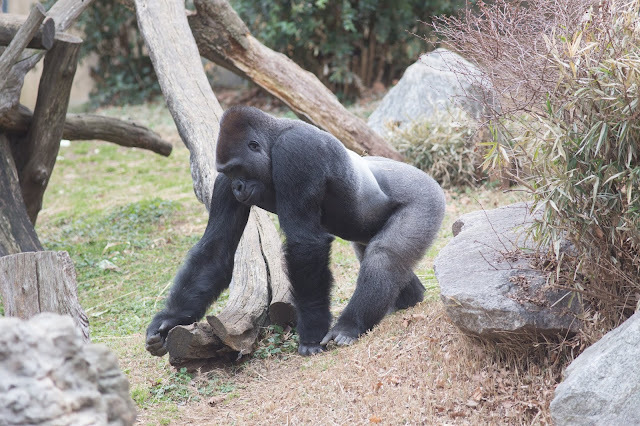 All of the social experiences that Kwame has had during his life have prepared him to succeed in this new role,” said Becky Malinsky, assistant curator of primates at Smithsonian’s National Zoo. When he gets here, Kwame will live behind the scenes in the gorilla dens, and he won’t be alone. One of his keepers, who he knows well, will travel with him and will stay for a few days to make sure he’s comfortable. Plus, he’ll have immediate visual access to his new gorilla group to ease his transition and help him get to know the females who will make up his new family. Sharing the same physical space could happen in a matter of days, or weeks depending on a number of factors. Woodland Park Zoo’s mammal curator, Martin Ramirez, says that introductions between new gorillas take time and patience—allowing for our animals to move at their own pace. “As we do with all of our animal introductions, we’ll follow the social and behavioral cues of our gorillas. We hope to have Kwame in the public outdoor exhibit in the fall,” said Ramirez. Until then you can click here to see video of Kwame (along with other gorillas at Smithsonian’s National Zoo) enjoying one of his favorite treats: popcorn balls, which are small plastic balls filled with popcorn. As the gorillas tip and shake them, a popcorn treat comes out of a hole in the side of the ball. The video also shows the gorillas enjoying other enrichment items including hay feeders, boomer balls containing diced fruits and veggies, and burlap bags filled with hay and diced food items. All gorillas are endangered, but there are several ways you can help protect them. 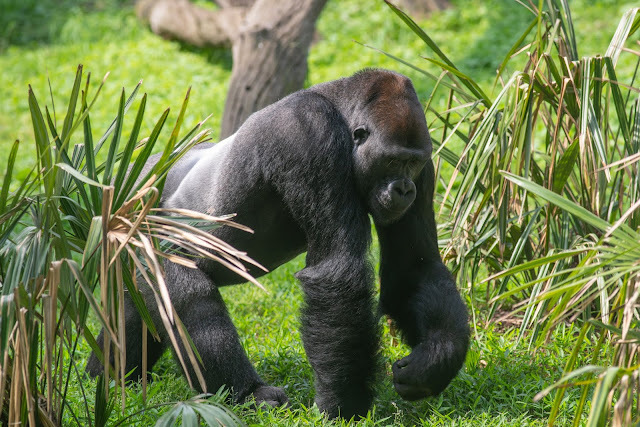 All gorillas are threatened by habitat loss, wildlife trade, hunting, disease and human conflict. Critically endangered and losing ground every day in the wild, gorillas need our help. 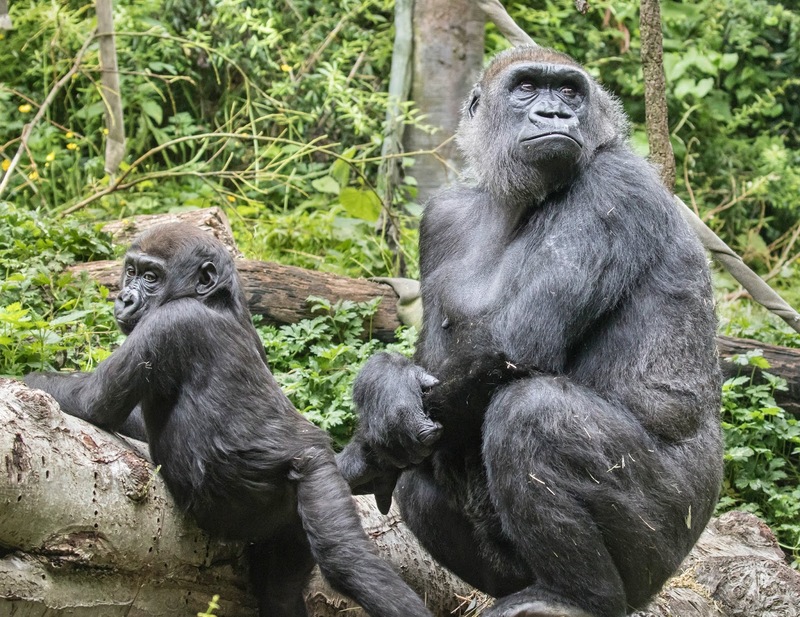 Woodland Park Zoo supports conservation efforts for the western lowland gorilla and mountain gorilla through the Mbeli Bai Gorilla Study and Dian Fossey Gorilla Fund. Click here to add your name to a letter opposing rules changes currently under consideration that would weaken the Endangered Species Act. Come recycle your handheld electronics with us through ECO-CELL to preserve gorilla habitat. By reclaiming the minerals in your electronics and diverting them from landfills, we can reduce demand for mining in gorilla habitat. 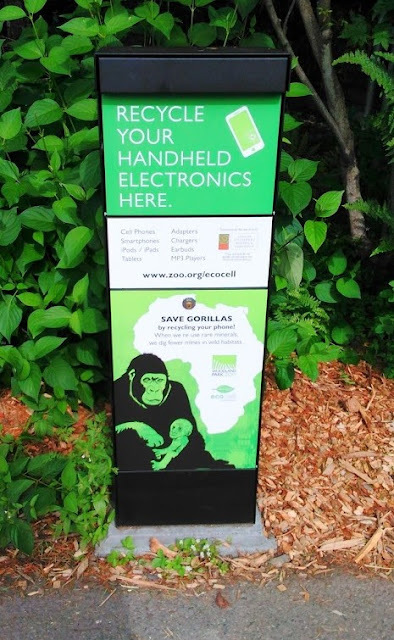 Bring any old cellphones, MP3 players, or tablets hanging around your house to the zoo and drop them off at our ECO-CELL stations located at both zoo entrances. 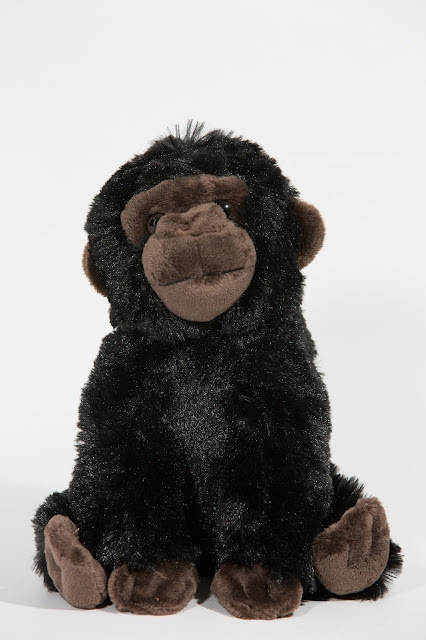 ZooParent adoptions—which can include a plush toy—are the perfect gift for budding conservationists. Your ZooParent adoption helps us provide exceptional care for all of Woodland Park Zoo's amazing animals. Plus, your support contributes to our conservation efforts at the zoo and around the world. Every visit to Woodland Park Zoo helps support our conservation efforts. We know many of you are eager to visit Kwame and watch as Yola, Nadiri and Akenji welcome him to their group. As time allows, and the gorillas settle in, we'll let you know when Kwame and his crew are on exhibit together—and we'll keep you up to date on their progress right here. Earlier this summer, in celebration of the opening of Assam Rhino Reserve, we asked artists of all ages to show us their vision of a healthy future for greater one-horned rhinos with the Rhino Lookout coloring contest. "They are living creatures and they are alive. And you need to save them when they’re in trouble. If you’re there, try to stop the bad guy." 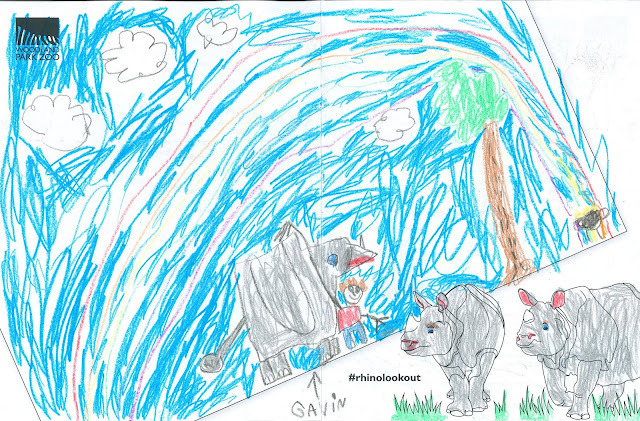 We couldn't agree more, Gavin, and we loved your optimistic pot of gold representing a healthy future for rhinos. Wonderful drawing! 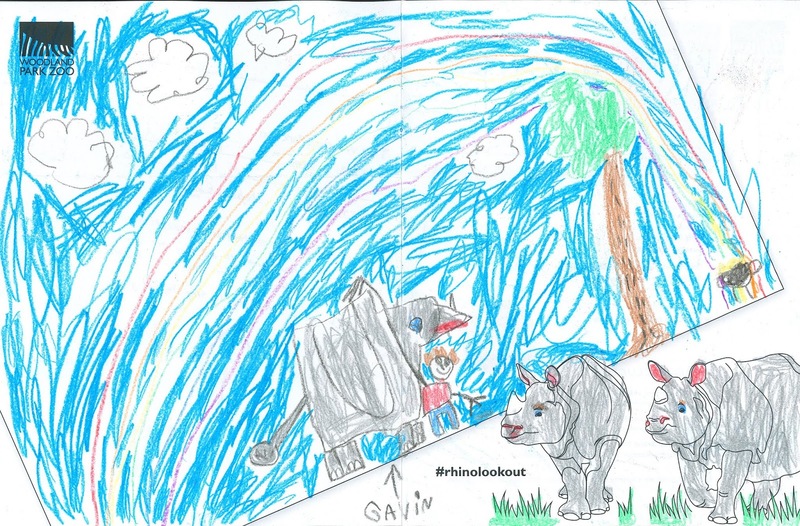 Gavin will receive a ZooParent rhino adoption package and certificate for an up-close rhino experience. "It is important to protect them from poachers, habitat loss, and other threats. 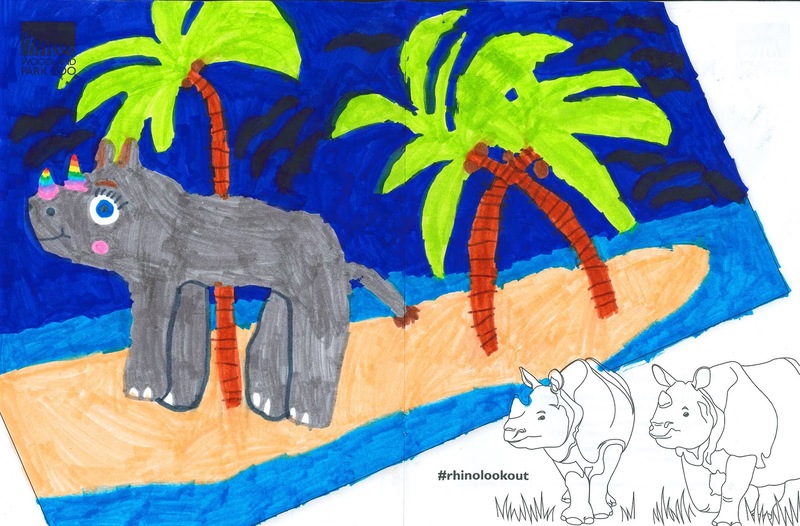 Rhinos are critically endangered. 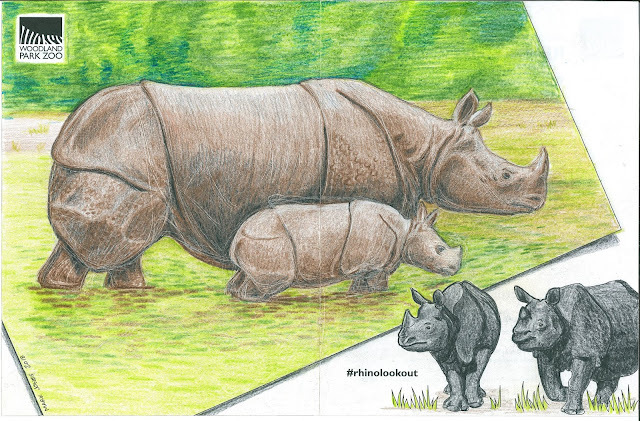 If rhinos go extinct, the survival of other animals would have a deep impact. Also the ecosystem would be unbalanced. The area would be less grazable. 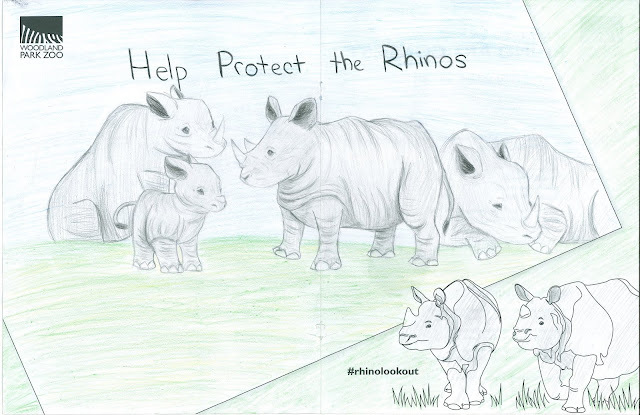 We need to protect the rhinos." We're not sure we've ever seen a more adorable rhino crash (group). Beautiful drawing, Ally, and you are right, without rhinos the world would be a very unbalanced place. Ally will be invited to a keeper tour and up close experience with greater one-horned rhinos Taj and Glenn. "The critically endangered status of these animals are caused by our past ignorance. To me, being able to protect rhinos, their habitat, and the entire ecosystem of wildlife they are a part of, is an indication that humanity is capable of learning from our mistakes. To make mistakes is human, but what matters is how we respond to them. I want us to respond to this with the utmost urgency and dedication to prove our humanity." Wow, first of all, beautifully said. 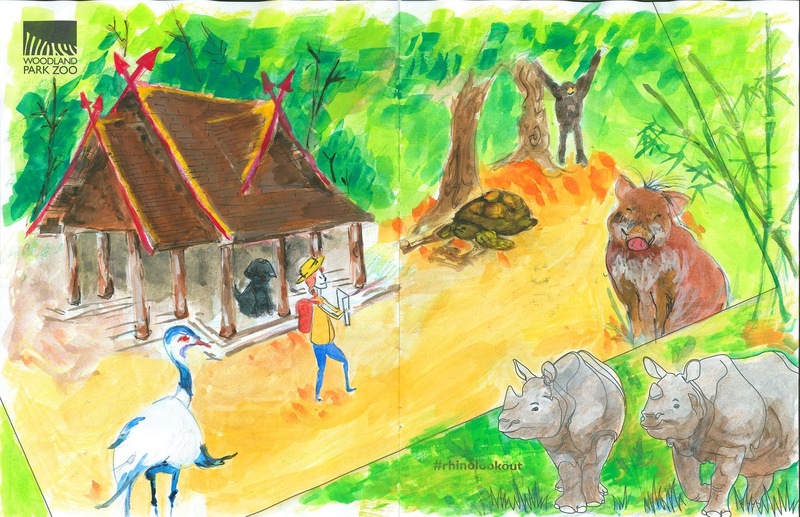 Jiali, we were blown away with your painting of rhino habitat and Assam Rhino Reserve. What a creative interpretation, and so inspiring! Jiali will be invited to a keeper tour and up close experience with greater one-horned rhinos Taj and Glenn. "Rhinos are an endangered species. Without rhinos other animals will be effected in their ecosystem." "I want them to do cool things like rainbow horns and live on the beach in the future." 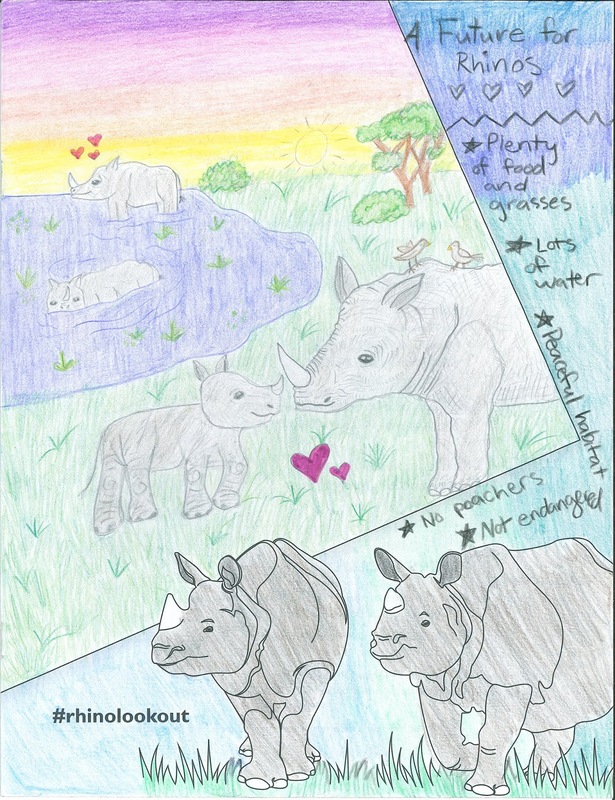 "Rhinos are in danger. People are killing them because of their horns. They are using the horns as a medicine or as a trophy. One way to protect rhinos is to cut the horn. 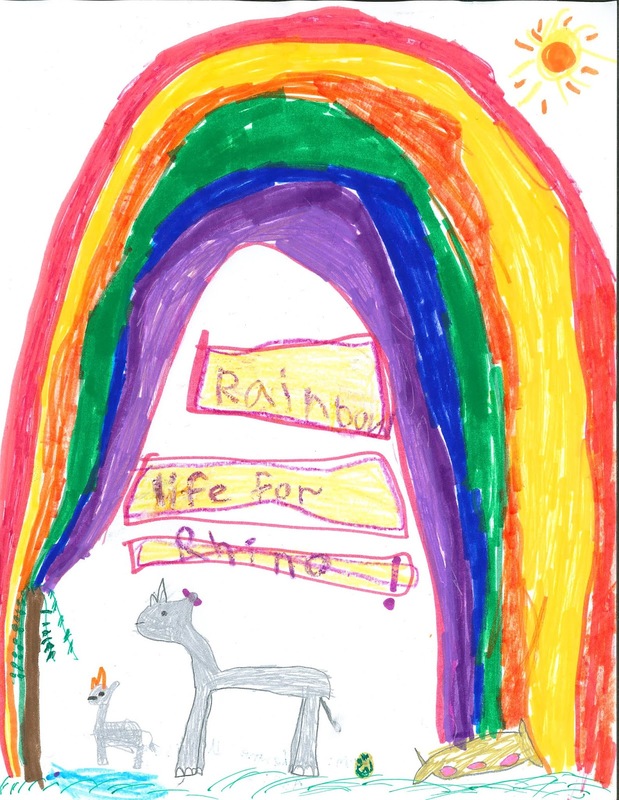 I want to save rhinos because they are smart and part of our rainbow planet Earth!" "They are incredible animals. There’s no other animal like a rhino. I know that tons of people care about rhinos, but some hurt or kill the rhinos. We must stop that now because they don’t deserve it. I hope someday I can raise a lot of money to donate to protecting endangered species." "It is important to save rhinos because rhinos are almost extinct. Rhinos are special because they are relatives of mammoths (one interesting theory). Rhinos are basically mammoths that evolved to one horned mammoths then to one horned rhinos. It is important to save them from extinction (we may be saving mammoths!) 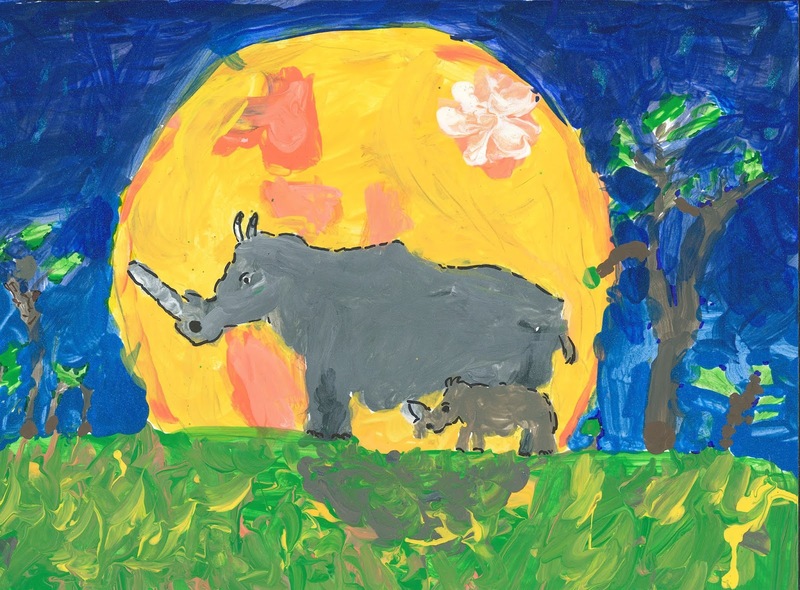 It is also important for me because rhinos are part of our beautiful planet. I want my kids and grandkids and other generations to enjoy this amazing animals forever. I love coming to Woodland Park Zoo to see these smart animals. I hope one day in my life I will know their population is not in danger anymore. 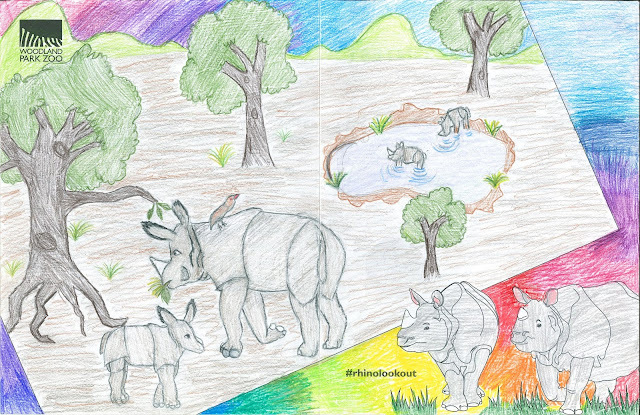 The planet Earth without the rhinos will never be the same." "I love rhinos! These majestic, beautiful animals have been around for eons, and they deserve our help so they will be around for many, many more years. Looking forward to seeing the rhinos at the zoo!" 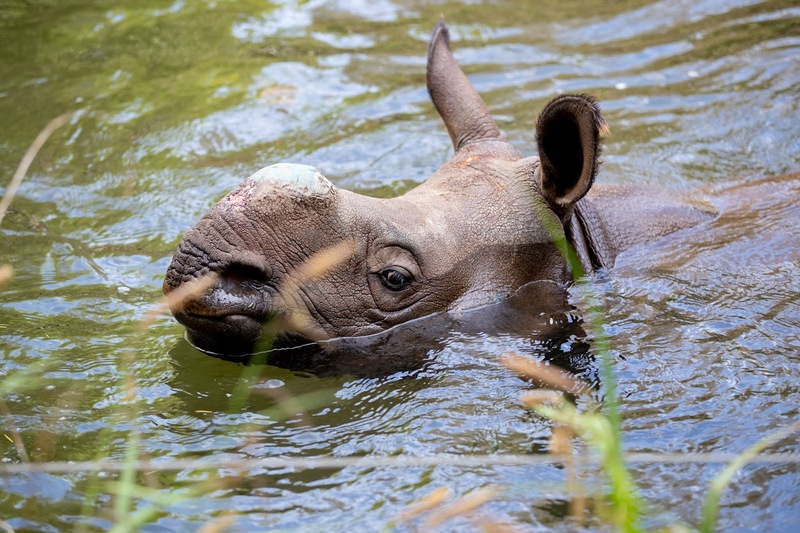 "Many animals, including rhinos, help shape our ecosystems. Without rhinos, the world might look extremely different. Rhinos graze on grasses, and that carves paths for other animals. Each animal is like an essential piece to an enormous puzzle. Without one piece, the puzzle is unbalanced and incomplete." 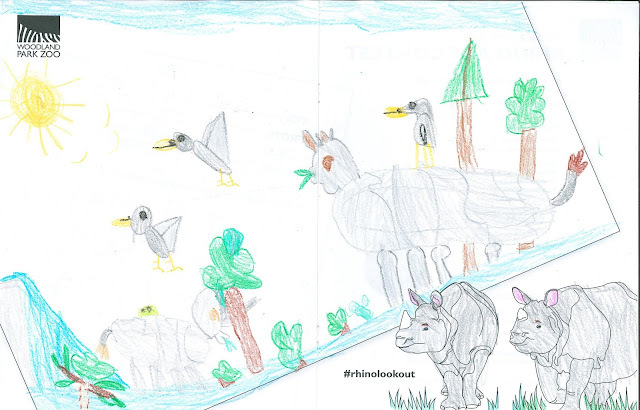 All of our Runners Up will receive a rhino-themed prize from our ZooStore. Thank you to all of the incredible artists who participated in our Rhino Lookout contest. Your optimism and hope for this species matches your talent and creativity—the world is a better place with your artwork and sentiments in it. Taj the rhino at Assam Rhino Reserve. Photo by Jeremy Dwyer-Lindgren/Woodland Park Zoo. Many thanks for a fantastic plastic-free July! Photos by Daphne Matter, Woodland Park Zoo. 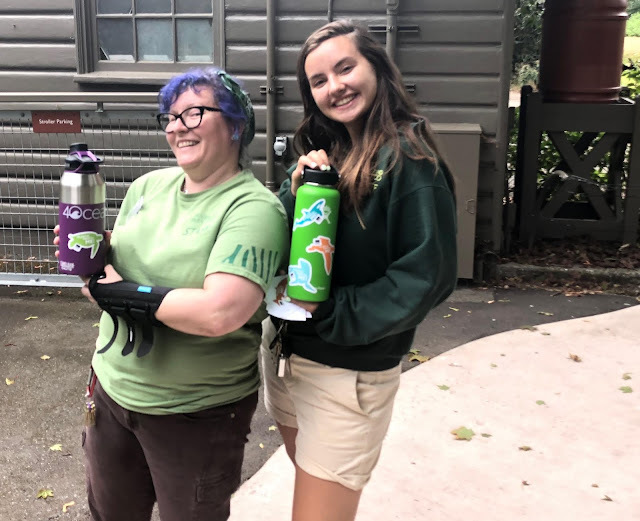 Woodland Park Zoo staff pledged to reduce or refuse single-use plastics during Plastic Free July! With support from Seattle Public Utilities, we then invited you to join us by taking the Plastic Free for Me pledge. Here is a recap of what we learned, what we found difficult to give up and a few surprising plastic confessions. 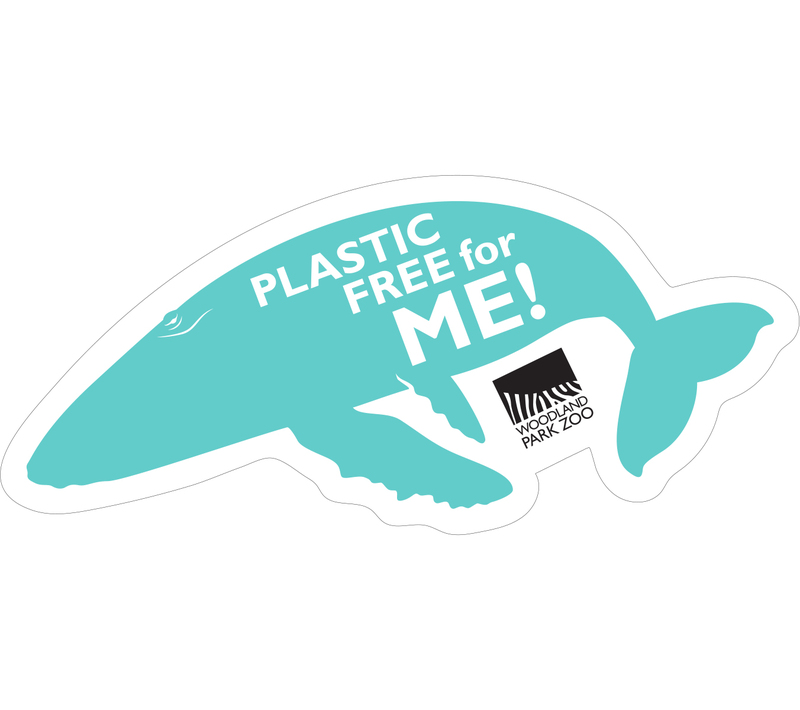 Participants will receive a #PlasticFreeForMe water bottle sticker. Thank you to all those who participated in our Plastic Free for Me campaign! 236 of you joined us in our collective effort to lessen our impact on the environment during the month of July. By reducing your consumption of single-use plastics and taking this pledge, you have done your part to save wildlife from the great threat that plastic pollution poses. 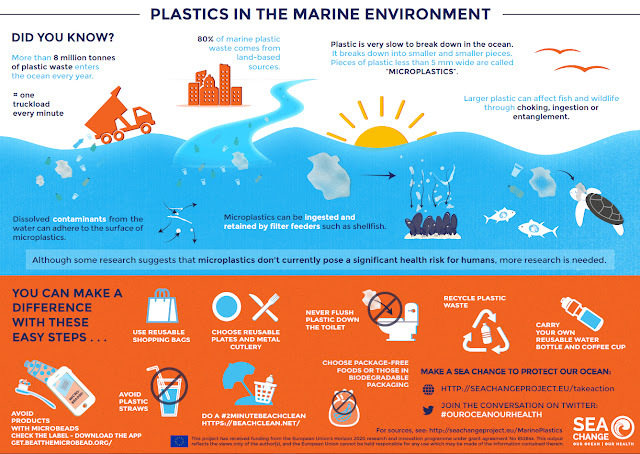 Why is it so important to keep plastic waste out of our oceans? Plastic presents a grave issue in our world today, especially for marine life. It is not biodegradable, meaning it never breaks down. Plastic only breaks up into smaller and smaller pieces, meaning that the large majority of all the plastic that has ever been made (9 billion tons!) still exists on our planet today. Our rapid consumption of single-use plastics (like water bottles, bags, straws, packaging, and more) is only creating more of this pollution. Our amazing ZooCorps interns who helped out with Plastic Free July and Plastic Free For Me! Maddie and Daphne definitely earned their stickers! Although large plastic litter is very harmful, the majority of the plastic in the oceans is less than a quarter of an inch long. These tiny pieces of broken down plastics are called microplastics. Microplastics make their way up the food chain and contaminate it, including much of the seafood we eat! 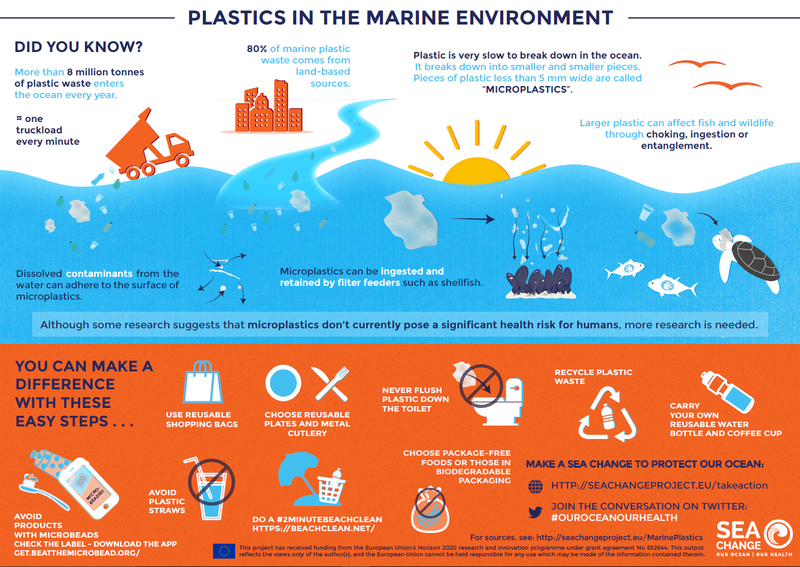 Even with the few plastics that are recycled, they are almost always only recycled one time before it becomes waste, and most of plastic waste ends up in the environment, posing a huge threat to many marine ecosystems and species worldwide. We also went plastic bottle free at the zoo this summer. 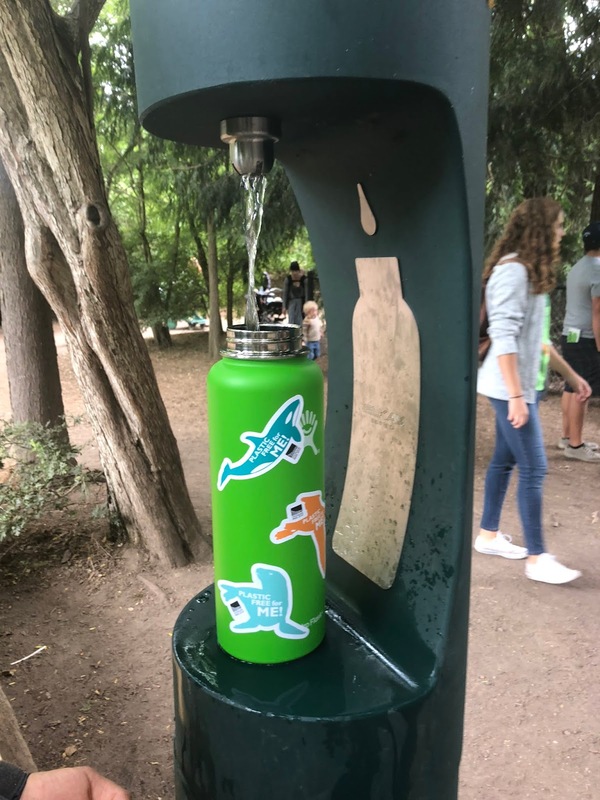 You'll find water filing stations across the zoo! By the end of our July campaign, we had received 236 pledges! A common trend we had not expected was how many people’s confession included having reusable bags in their car, but forgetting to bring them into the store when they shopped. This means that that although the reusable bag may just be in the parked car outside, they ended up still walking away with single use plastic bags. There were also a large number of iced coffee drinkers who use single use plastic cups every day. It's so easy to forget to make these simple actions into habits. Marvelous Coastal Sea Turtle Accomplice “In every way! Plastics at the grocery store, forgetting my reusables, not speaking up. Takeout, takeout, takeout!" The great news is that with over 200 pledges taken, we have put a stop to these practices for one entire month and have learned how easy it is to do better in the future! Participants will receive a limited edition #PlasticFreeForMe water bottle sticker to proudly share their success with others! The stickers are durable, waterproof and made from 100% recycled materials from PURE Labels, by Elevate Packaging. We would love to see your stickers on social media! 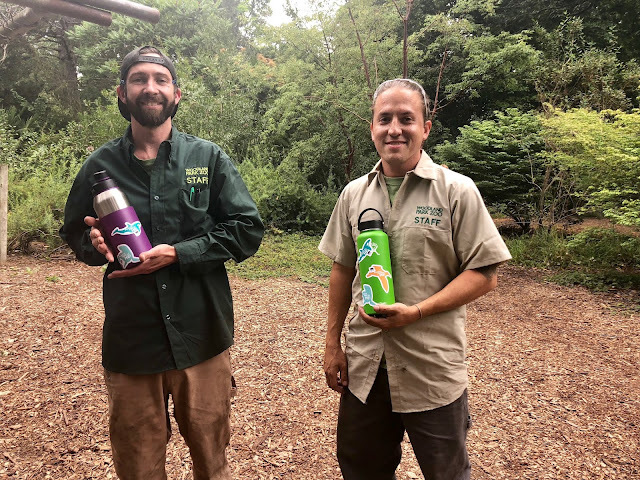 Share a photo of your reusable water bottle and sticker on your next adventure and tag #woodlandparkzoo. In addition to the great work you all did with #PlasticFreeFor Me, zoo staff were also challenged to do more. During Plastic Free July, 214 of Woodland Park Zoo's staff and volunteers stepped up to the plate and took on the challenge of reducing their single-use plastic consumption. Throughout the month of July: Over 1,200 pieces of litter were kept out of Puget Sound Over 300 zero-waste meals were made Over 400 disposable containers were kept out of landfills Over 1,500 minutes were spent learning about alternatives to single use plastic... and so much more! Across America, 77 other zoos and aquarium teams joined us to take enormous strides towards reducing single-use plastic waste. Together, all 78 teams kept over 68,000 straws and utensils out of landfills, made 9,000 zero-waste meals, over 14,000 disposable cups and 16,500 single use containers out of landfills, 2,000 petitions signed and conversations had with public officials supporting reducing single-use plastics, and tens of thousands of other actions. Whew! Now we’re heading into the month of August and Plastic Free For Me is technically over, but we challenge you to keep these practices up going forward to help save our oceans. Even if you missed the challenge in July and didn’t make a pledge, you can always start being an animal hero now by bringing reusable containers when ordering out, attending a local cleanup, buying unpackaged produce and minimally packaged products, or learning about plastics and the ways you can do your part. Keep those plastic free habits going and make a big difference for wildlife! River otter! Photo by John Loughlin/Woodland Park Zoo. Coyote picture captured by a camera trap as part of a student research project. Photo: Issaquah School District and Woodland Park Zoo. Woodland Park Zoo is on a new mission, to save wildlife and inspire everyone to make conservation a priority in their lives. 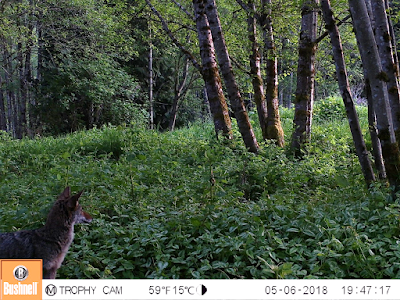 We think that starts right here, in the Pacific Northwest, where we are working with Issaquah School District 6th grade Life Science students and teachers to investigate local carnivores and use their findings to make recommendations for peaceful coexistence to their community. Students began their projects by gathering information on carnivore sightings in their community by asking their families, friends and neighbors for their observations. By plotting these sightings on a map, students were able to look for patterns and ask questions about how carnivores are using natural and human-made landscape features to meet their needs. 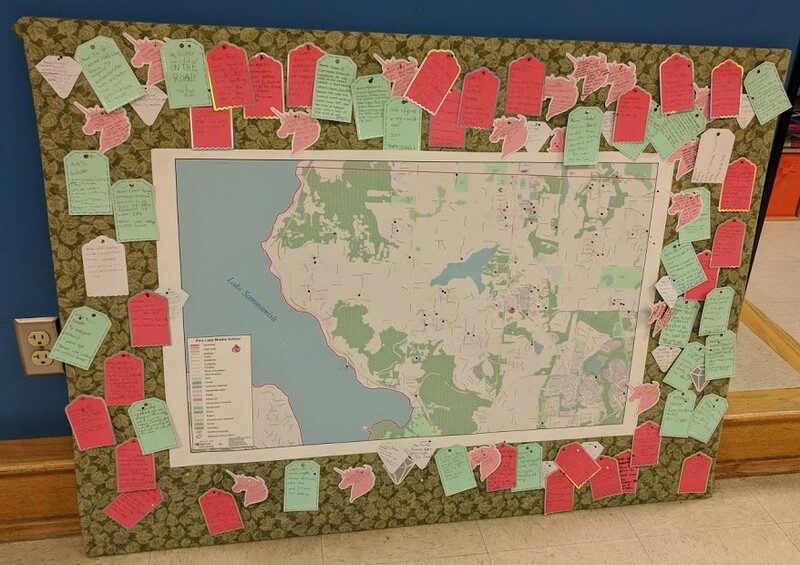 Community map of local carnivore sightings from Pine Lake Middle School. Photo: Kelly Lindmark/Woodland Park Zoo. In March, students visited Woodland Park Zoo for two programs with zoo staff. While exploring the Northern Trail, students learned about Pacific Northwest carnivores including brown bears, black bears and gray wolves. In the multimedia, interactive Wild Wise program, students learned about the wildland-urban interface, human-carnivore interactions across the landscape, and research methods they could use for their upcoming projects. Beaver Lake Middle School students touring the Northern Trail. 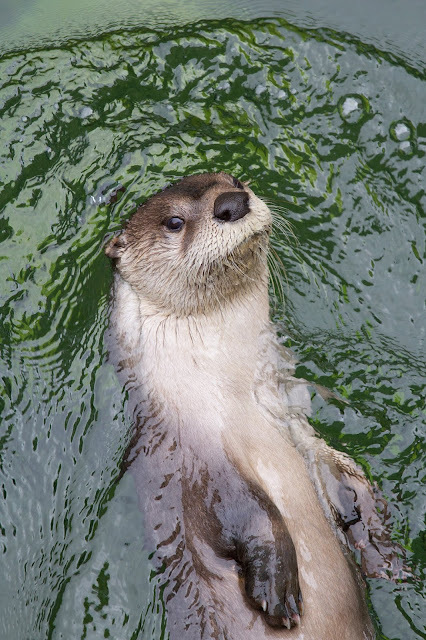 Photos: Emily Felty/Woodland Park Zoo. With their zoo exploration and community data in mind, each class generated a comparative investigation question about how carnivores are using the surrounding landscape. With the support of their teachers and zoo staff, each class planned research methods to gather the data needed to answer their question. 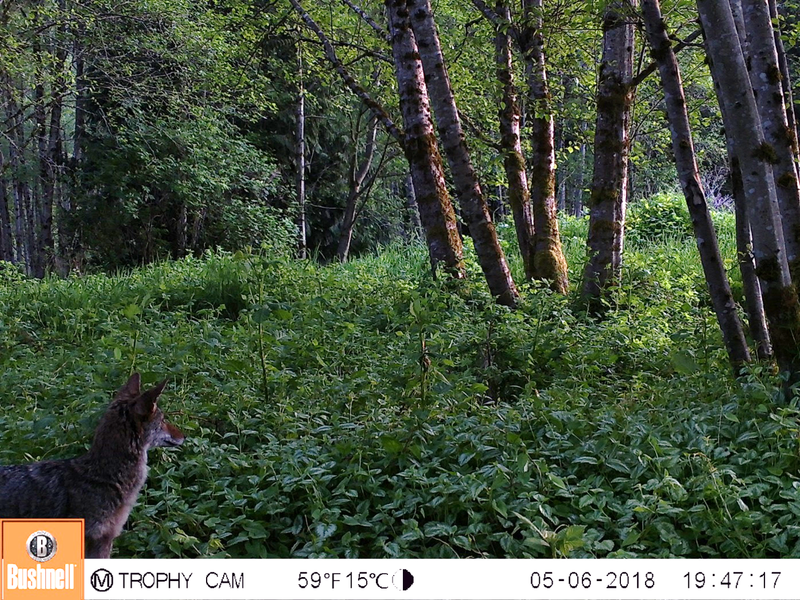 This year, classes chose a variety of methods including camera traps (cameras with infrared and motion triggers to capture pictures of wildlife), online surveys, community mapping, and walking surveys to look for signs of carnivores and their prey. Zoo staff facilitate a discussion of methods with students. Photo: Emily Gogerty-Northrip/Woodland Park Zoo. Western Wildlife Outreach (WWO) is a local non-profit promoting increased understanding of large carnivores through education and community outreach. 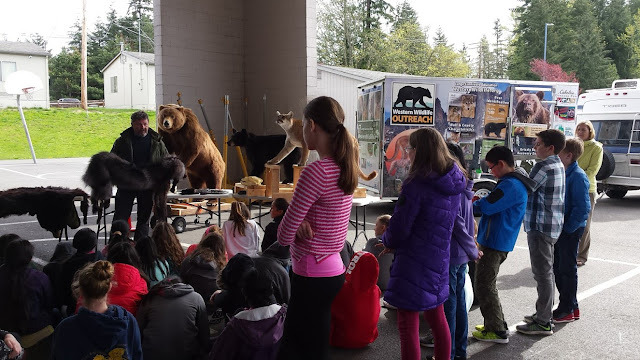 WWO brought their Carnivore Outreach Education Trailer to each school, where students explored biofacts such as pelts and skulls, heard tips for coexisting with different carnivores, and asked WWO staff questions to help with their ongoing research projects. WWO Carnivore Trailer Visit at Pine Lake Middle School. Photo by Alicia Highland/Woodland Park Zoo. After data collection was completed, students worked in small groups to discuss, analyze, and interpret their data. 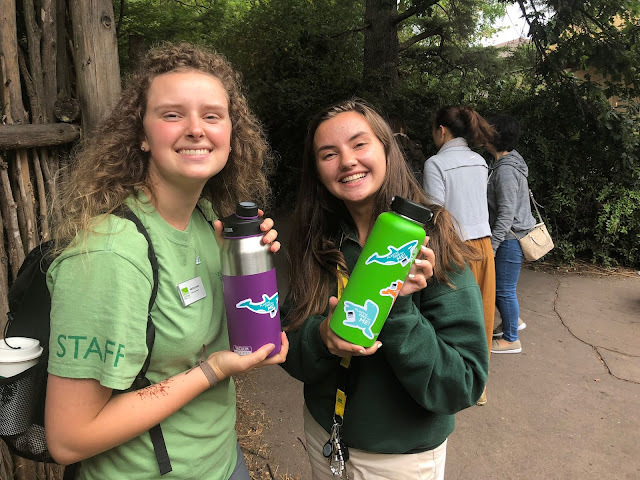 Based on their findings, student groups identified the key takeaways and actionable recommendations for community members and prepared posters and presentations to share their projects with zoo staff and the community. Zoo staff visited each class to hear the final results from each group. On June 6th, students, teachers, families, and community members came together for an All School Event showcasing student projects. During a poster session, students shared their posters and answered questions about their projects. Eleven student groups were selected to represent their schools and gave presentations about their research process, findings and recommendations to their community. Student projects included investigations of carnivore use of hiking trails, interactions between carnivores and trash cans, and carnivores interact with household gardens. One student group investigated whether carnivores are seen more often in newer or older neighborhoods. Their data showed that carnivores were seen more often in older neighborhoods, so their recommendations were focused for residents of these older neighborhoods to engage in proactive behaviors such as keeping a bear bell on outdoor pets, keeping trash indoors and learning what to do if you encounter a carnivore. Students shared posters and presentations with the community at the June All School Event. Photo: Katie Remine/Woodland Park Zoo. All told, over 175 projects were created this spring! While learning more about local carnivores, students developed a deeper understanding and appreciation for these species. Throughout their research process, students gained real-world experience with a variety of scientific practices including asking questions, planning and carrying out investigations, analyzing and interpreting data, and communicating their findings. 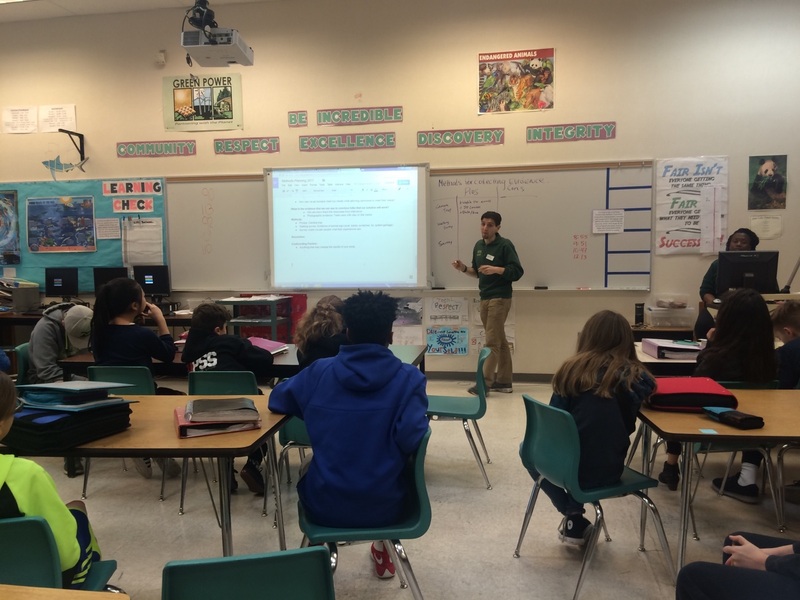 Finally, students leveraged their new expertise to be a voice for peaceful human-wildlife coexistence in their community. We would like to thank the students and educators for their thoughtful investigations, dedication and creativity with their projects. We are grateful for the generous support of the Issaquah Schools Foundation, the Institute of Museums and Library Services: Museums of America program and Carter Subaru that make this program possible. We would also like to thank The Hugh and Jane Ferguson Foundation, the James Lea Foundation and the Tulalip Tribes Charitable Fund for their support of this project. Wild Wise: Coexisting with Carnivores is part of the larger Coexisting with Carnivores program, a collaboration between Woodland Park Zoo and the City of Issaquah that provides Issaquah residents with opportunities to appreciate local carnivores and the practices that can make coexistence easier—both for people living in the community, and the animals that call Issaquah home. Look out for Coexisting with Carnivores events in Issaquah this year, and come chat with Woodland Park Zoo staff at the Issaquah Farmer's Market on September 15 and 22 to learn more.